Swivel Joints are used for stringing operation in overhead transmission line stringing or underground cable pulling. It is constructed with heavy duty ball bearings inside, to eliminate the torque force during the stringing. Swivel joints are used to eliminate the torque force during pulling conductors or OPGW cables in the transmission line stringing operation. 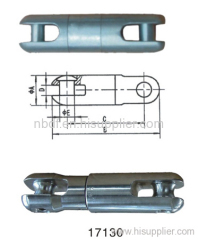 Group of Swivel Joints has been presented above, want more	Swivel Joints and Stringing swivels, Please Contact Us.